Previously we said that, since your baby’s born, she begins developing hand and finger strength, control, and coordination with even the smallest things. We’ve also talked about how she works to develop her pincer grasp. Since our hands are necessary for almost everything we do, it is very important to help your little one develop these skills every chance you get. Even though your little one is too young to know how to hold a pencil in a writing position, color with controlled strokes, or manipulate playdough, she can begin building the underlining abilities that will help her manipulate objects and begin making controlled movements with her fingers. Blocks are a great way to practice this! Their use began in 1693 by John Locke. Afterwards many well-known educators started emphasizing their importance including Friedrich Froebel, Maria Montessori, and Caroline Pratt. Today they are a very popular tool for child play and development. 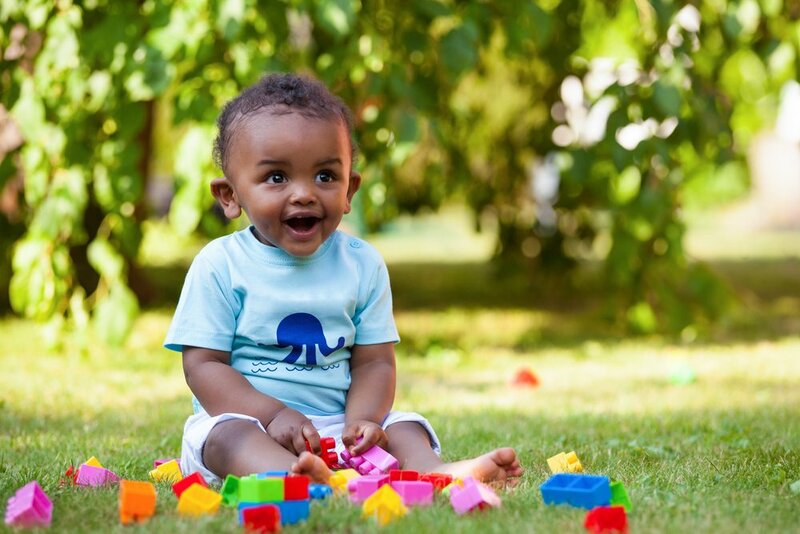 At around 10 months, your daughter will begin to be interested in the items she’s holding; building blocks and specially block towers will start getting her attention. She might not be able to stack them up just yet, but just by grabbing them she’ll start working on her hand division and future pincer grasp. First, she’ll grab the block with her whole fist without using the thumb. Then, you’ll notice she starts folding her fingers and gives the thumb a little more stability to press the block. As she practices, her fingers will start separating and the thumb, index, and middle finger will become the protagonists. This movement provides the blueprint for future skills like writing, tying shoelaces, and brushing her teeth. Around 12 months of age she’ll start investigating the block more thoroughly. She’ll begin getting wrist and forearm movements involved, which will allow her to turn the block around and gain more hand-controlled movements. She’ll also be developing more stability on her shoulder. The contraction of the muscles of the shoulder joint will hold the shoulder steady and allow her arm to be held in different positions while the forearm, hand, and fingers manipulate the blocks. She’ll start being more interested in the shape, color, and size of things which will allow her to practice grasping small and big objects. She’ll become a pro at placing them in and out of containers, picking them using only her thumb and index finger, and even holding two things with a single hand. This will foster her hand-eye coordination. At around 19 months she’ll not only be able to manipulate the block and explore its different angles, but she’ll also be able to look where she wants to place it as she holds it. This kind of skill will get her brain working with two systems, an ability she’ll later need at school when she’ll need to look at the blackboard while writing on her notebook. Over time and with practice, you’ll see that around 30 months of age her precise finger movements and hand and arm coordination will allow her to build towers of 9 blocks and even more complex structures. She’ll also begin to understand the complexity of them, how to stack them, line them up, and how they fit into each other in different ways. Her play and exploration will get her on the right path of future skills she needs on a daily basis like handwriting acquisition, the ability to use scissors, and working with buttons and zippers.